We don't get to review many accessories these days, for reasons that are fairly obvious: nobody makes or sells webOS devices, so why would anybody make accessories for those devices? It's a hard life for the accessory-wanting HP TouchPad, HP Veer, or HP Pre3 owner. But just because they aren't available doesn't mean accessories don't exist. For example, there's the Touchstone bluetooth audio dock, a never sold and never announced successor to the original Touchstone that incorporated Bluetooth audio streaming into the charging mix. At least a few have landed out in the wild, but they're exceedingly rare. You know, like the HP TouchPad Go. We've managed to get our hands on one such example of the HP Touchstone 2 Audio Dock, and it's partly what we expected, and partly not. We all know that choice is good. Choice gives us freedom. We celebrate our ability to make the choices we want, such as Pepsi or Coke. Mac or PC. If you've ever felt the need for choice in your Touchpad mapping options then WebOSM by Maël Lavault may be the app you've been waiting for. WebOSM utilizes the OpenStreetMap database, offering the user a choice between it and the built-ine Maps application that uses Microsoft's Bing maps. Lavault goes a step beyond that, offering up webOSM through the webOS Nation Homebrew Gallery for free or from the App Catalog for what amounts to a $0.99 donation. 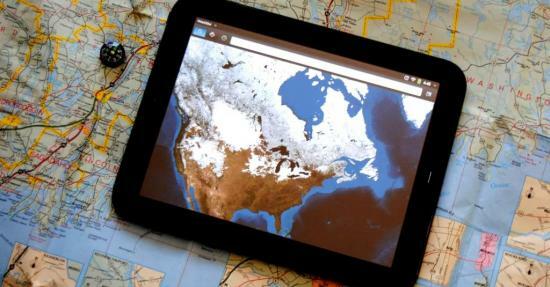 OpenStreetMap is the community-built free and open source road maps database that powers WebOSM. Anybody can make edits to OpenStreetMap, in essence it's like the Wikipedia of road maps. Using OpenStreetMap comes with some advantages and disadvantages. OpenStreetMap tends to be more detailed on the micro level than Bing or Google, often having extended paths and driveways for apartment complexes and university campuses, and has denoted many more local landmarks such as churches and schools. It also sometimes lacks some political boundaries and topographic data, as well as detailed aerial imagery (or roadmaps overlain on the available satellite imagery). Thanks to the crowd-sourced details in OpenStreetMap, urban areas are often highly detailed, while rural stretches might be as lacking in side roads and goat paths as they are people in real life. 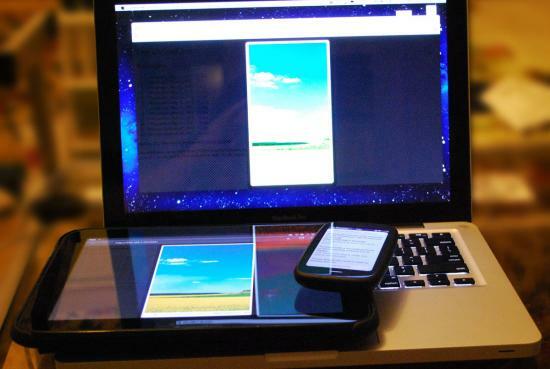 HP was gearing up to try something really interesting with webOS. We're not entirely sure how Music Synergy would have worked and where HP Play could have gone, but as you well know, things didn't go what we could call "according to plan". If you're an iTunes user, you can get a little bit of TouchPad musical synergy going today for free, all thanks to a delightful app named Retune. Personally, I nearly skipped over Retune when browsing the App Catalog thanks to its less-than-stellar icon. But for whatever reason I tapped it and a surprise I did receive. Retune is a full-fledged iTunes remote, duplicating in parts the iTunes interface and layout, but still keeping it very webOS. It is reliant upon a Wi-Fi connection to your computer (Mac or PC) running iTunes; everything here is pulled from and pushed back to iTunes. The app is an incredibly fancy remote to control iTunes or your Apple TV - it's not a remote iTunes player. That distinction must be made clear. But let's be honest, your computer or TV is likely hooked up to the better speakers in the house, not your TouchPad. This is for changing tracks or pausing the music while in another room or just without having to put down your TouchPad and dig up yet another remote. And at that, Retune excels. Today started out like any other day. I got up, cleaned the house, did the dishes and fed the puppies. Then as I was about to get ready to work out, I started looking thru my music collection on my Pre3 looking for something new, fresh and motivating to listen to. Cause believe me guys, there are only so many times I can listen to "L-U-V Madonna, Y-O-U you wanna?" before letting my puppy Penny tear up my headset out of sheer boredom. I even tried desperately scrolling through iTunes to see if I could find something new through their its "Genius" feature. Some genius, it just gave me suggestions of already established artists and of music I had already purchased. What was I going to do? Spend time on the internet searching for somebody new? Listen to the radio and its billions of commercials on the off chance I might find something that would give me goose bumps thru a lyric or a beat. I wanted to find the next Lady Gaga or Annie Lennox and I had some empty space on my TouchPad that I wanted to fill it with new music. I am a passionate woman and I need a new music like Sharon Stone needs a good movie. But lo and behold I found a new app in the App Catalog that fit the bill for me: Music Discovery. Editor's note: It's my pleasure to introduce another new writer to the webOS Nation: Scott Rose! Scott is a mcirobiologist by day and a webOS fan by night. In addition to long walks on the beach, he enjoys Linux, nature photography, and spending time with his wife and daughter. Everybody say hello to Scott! Before you get too excited, we will dash your dreams right off the bat by saying that this is not a Netflix viewer. We know it's causing you crippling disappointment, but it's up to Netflix to make an app to let us watch their content on the TouchPad. That aside, Flix by Uncommon Application for the Touchpad is a Netflix app for displaying titles that are coming soon, about to be deleted, and recently added to Netflix's colossal library. The entire app design is quite minimalist and text-oriented. It almost has a Windows Phone feel to it. 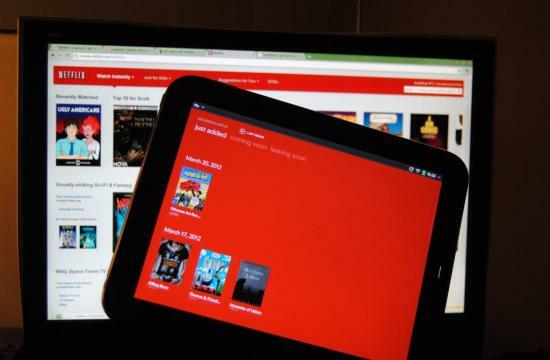 Unlike most webOS apps, Flix is overwhelmingly monochromatic, but yet a bright Netflix red. At launch, Flix opens into the recently-added view for Netflix's library, providing a date-oriented list of movie post/box art and titles, all on that red background. The top of the screen provides text-based navigation, with a “delivered by Netflix” link that opens the web browser to NetFlix's website, and “last viewed,” which will serve to return you to the title you last viewed. Below that are three options: just added (highlighted, as this is the list you're looking at), coming soon, and leaving soon. "Just added" and "coming soon" are pretty obvious, being new and upcoming entries in the Netflix catalog, while "leaving soon" provides a glimpse into the side of Netflix we don't like to think about - due to licensing restrictions some titles leave the Netflix library after a certain period. Editor's Note: Everybody give a warm welcome to our newest writer, one Sharon Copeland! She's a force of nature in the webOS community, though you probably know her as TeckieGirl from the webOS Nation Forums and Twitter, and now she'll be bringing her ways to the webOS Nation blog! In the northern hemisphere of our blue marble it's now springtime, and what a spring we've had so far. In some places we've skipped right over spring and into the heat of summer, while others are still stuck in winter's clutches. It's one of the oddest cross-continent weather trends in recent memory. I live in the American heartland, and the past few days have had us under the gun for bad weather. Thank goodness I have a great weather app on my TouchPad to keep me informed when the storms are approaching: it's AccuWeather, and boy is it beautiful. 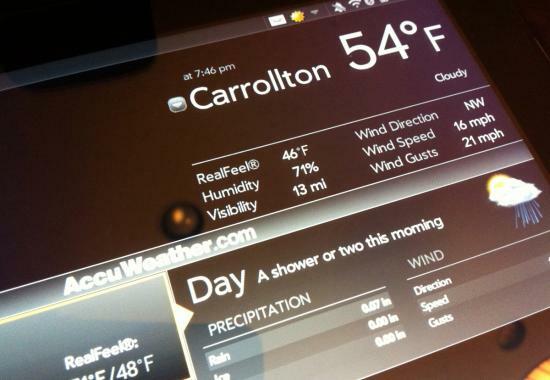 AccuWeather on the TouchPad gives you a complete 14 day forecast, 'real feel' temperature, alerts and radar at your touch and it's all customizable. And for you with allergies, it also includes a pollen count. Upon first launch AccuWeather will ask you to add a location, since you have a TouchPad you don't have GPS, so you'll have to do it by city name or zip code. You can add multiple locations and switch between them at will. However, if you are looking for some more heavy-duty battery life for your Pre3, you may instead want to consider the 2800 mAh XL battery from Mugen. 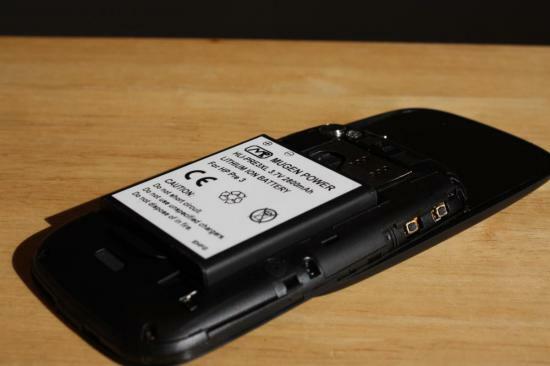 After putting our review battery through its paces, our overall reaction was quite favorable. While the battery's capacity is twice the size as the SL extended battery, it is also physically bigger, weighing 1.7 ounces (48 grams) as compared to .85 oz (24 grams) of either the stock or SL extended battery. As a result of the larger size, it also requires a larger back cover for the phone which is included with your purchase. For this review, we will focus on both the affects on battery life but also the affects of the larger back cover. The built-in Memos app for webOS isn't all that great. We all know it. With a big 9.7-inch screen like that on the TouchPad, its even more unforgivable how basic it is and how little its been updated. If there's one good thing about the pitifulness of the TouchPad Memos app, it's that it has opened the door for several third-party developers to built the better notepad. One such developer is Inglorious Apps, who created the aptly titled and well-featured Notes HD. For the asking price of $1.99, Notes HD drags memos on webOS up to modern standards. Well, really it brings back a lot of the features from the Palm OS Memos app, including titles, password protection, and categories (gasp). Last week as part of Mobile Nations Fitness Month we took a look at Speedy Marks' Workout, an interval training timer app. The gist of interval training is that exercising in bursts of high-intensity instead of a continuous moderate intensity results in a more effective workout. While Workout provides a pretty basic approach to the concept of interval training, A1 Fit Interval Trainer by A1 Development takes comes at it with more customizability information presentation. Upon launch you're presented with a set-up screen asking you to specify your warm-up and cool-down times, how long you'd like each high- and low-intensity period to last, and how many cycles you'd like the app to run you through. Hit the big green start button and you're thrown to the timer screen. There are two countdown timers, with your current period timer at the top and the total time remaining at the bottom. Each is accompanied by a shrinking progress bar, with the period timer's also listing the current activity (warm-up, high intensity, et al). Smack dab in the middle is a count of how many intervals through you are in the workout. Since you're not likely to have your smartphone up by your face when you're working out, A1 Fit has taken a number of steps to help you workout from a distance. There's the large bold text for the timers and the contrast of the progress bars and a loudly repeating chime at the change of each interval. Additionally, the background color changes with each interval, becoming orange for the warmup phase, red for high intensity workouts, green for low intensity, and a cool blue for the cool down period. You can turn off both the chime and the color change if you want to keep things calm. Smartly, A1 Fit also keeps the screen turned on through your workout. It might seem like a simple concept, but proper and consistent timing is important for interval training to be effective. Apps like the $1.49 A1 Fit Interval Trainer aim to make it as easy as possible to do so.